1912 was an eventful year by any measure. Who can forget the sinking of the Titanic- a tragedy which has never lost its fascination for writers and media moguls. 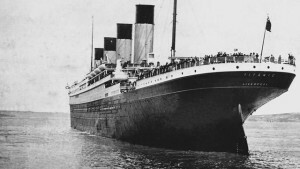 However, the Titanic was only one of the events of the year that captivated the public’s imagination. A second tragedy was much in the news in 1912: that of Robert Scott’s successful attempt to reach the South Pole. 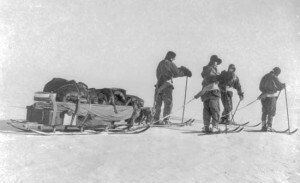 Scott arrived at the pole after a grueling journey over the icecap in January 1912 only to discover another explorer, the Norwegian Amundsen, had reached the pole about a month earlier. The dejected Scott and his companions struggled bravely to return to their base camp only to die of hunger and exposure just 11 miles from safety. Scott was unaware of how close he was to the base camp when he wrote his last journal entry “The end can’t be far”. He meant, of course, the end of his life and sadly didn’t realize that food and shelter were just 11 miles away. In Europe, Greece and its neighbors declared war on Turkey and other Europeans nations either made or confirmed a tangled web of alliances, many secret, which would lead to war two years hence. China became a republic. In the United States the marines were dispatched to Honduras, Nicaragua and to Cuba for the third time to ostensibly protect U.S. citizens. These endangered citizens were actually large U.S. business interests like United Fruit. New Mexico and Arizona became states and Teddy Roosevelt (having refused the Republican nomination for President at the convention) formed the Bull Moose Party. Not everyone was happy with Teddy’s decision, especially an unemployed Milwaukee bartender who shot Roosevelt just before the election as he was beginning a campaign speech. “It takes more than that to kill a bull moose,” the wounded candidate assured them. He reached into his coat pocket and pulled out a bullet-riddled, 50-page speech. Holding up his prepared remarks, which had two big holes blown through each page, Roosevelt continued. “Fortunately I had my manuscript, so you see I was going to make a long speech, and there is a bullet—there is where the bullet went through—and it probably saved me from it going into my heart. 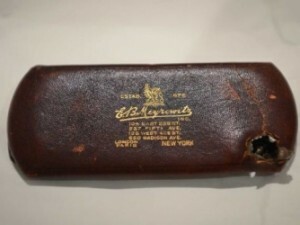 The bullet is in me now, so that I cannot make a very long speech, but I will try my best.” He later discovered his glasses case, pictured above, had also played an important role in saving his life. In sports Fenway Park in Boston opened, Casey Stengel broke into baseball as a Brooklyn Dodger with 4 hits, the Yankees went 50-102 for the season and Detroit Tiger Ty Cobb, angered at heckling by a fan, charged into the stands and dealt with situation in a more direct manner than officialdom found appropriate. He was suspended by baseball commissioner Ban Johnson. The Tigers protested and appealed the suspension and, when that failed to move the Commissioner, the Tigers fielded a team of amateurs which lost games by wide margins, one notably ended 26-2. Ban Johnson had to threaten to ban the Tigers from baseball altogether to get the regulars back on the field. In entertainment 1912 saw the debut of Tarzan and the Turkey Trot dance was all the rage. Because the dance was fast, played to ragtime music and some of the steps and landing positions were thought somewhat suggestive, the Trot was denounced by the Vatican and conservatives. The Curtis Publishing Company of Philadelphia even fired 15 women who had the audacity to do the Trot on their lunch break. Locally, Louis Mitchell and Sebat Lola of Pleasant Point, described in a Calais Advertiser newspaper article as “famous Indian whale killers” took on a 55 foot behemoth just abreast Carlow Island and from their canoes bombarded the whale with numerous volleys of rifle fire. 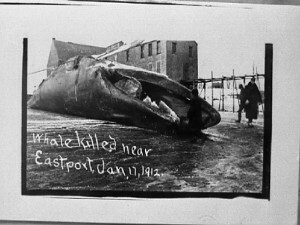 Weakened, the whale stranded on a sandbar and was finished off by with spears and axes. The contest continued long enough for spectators to travel by train to Pleasant Point to view the denouement. 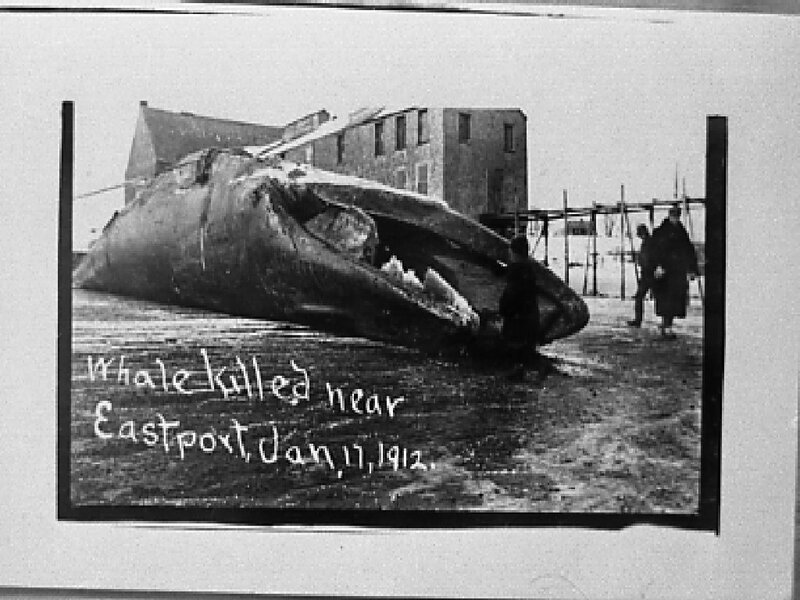 It was estimated the whale would yield 300 barrels of oil. 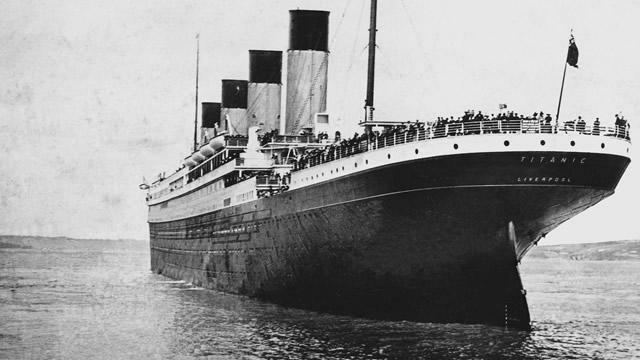 The water remained a dangerous place for humans too- Austen Anderson, a Norwegian sailor, was last seen leaning over the rail of his ship docked at the Eaton Wharf at the bottom of Calais Avenue. He was presumed to have fallen into the river and washed out with the tide. No search was made but many days later his body was found in the flats next to the Eaton Wharf. The ship’s Captain “is under the impression that in falling over, the man stuck in the mud, and when the vessel grounded, the body was pressed in the flats”. Charles Scott fell into the river near the public landing in St Stephen and his body was found under the Demont’s wharf on the U.S. side and a young boy, Fred Lawler Jr, fell off the Gates wharf at the bottom of South Street while fishing and drowned. Leona May Marshall, 20 and Ada Mercier Dodge, 21 were charged with murder when it was determined that they had thrown Marshall’s one week old infant into the river. The mother was heard to say in a Calais grocery store that “if she could not find anyone to take the baby she would kill it.” When she returned later without the baby, an investigation ensued and both women confessed to the crime. At the next session of the Superior Court they both sentenced to 3 years for manslaughter. 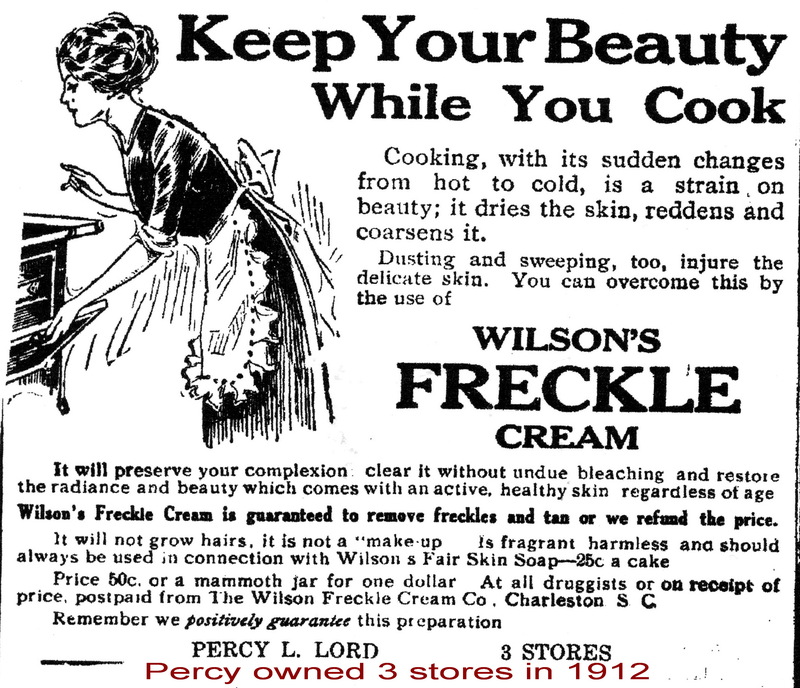 On the cosmetics front freckles were considered a serious threat to beauty a hundred years ago especially for those who dusted, cooked or worked over a hot stove, jobs certainly out of the male realm in 1912. 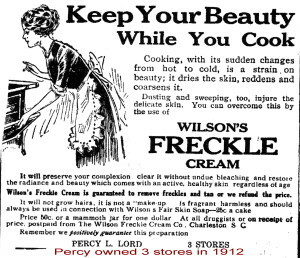 Numerous creams were available to deal with the problem including Wilson’s Freckle Cream sold at Percy Lord’s Drugstore. 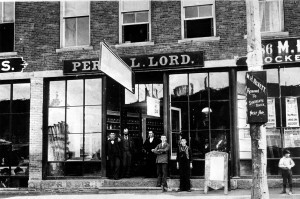 Lord’s Drug store later became the Rexall (later Treworgy’s), only recently closed. 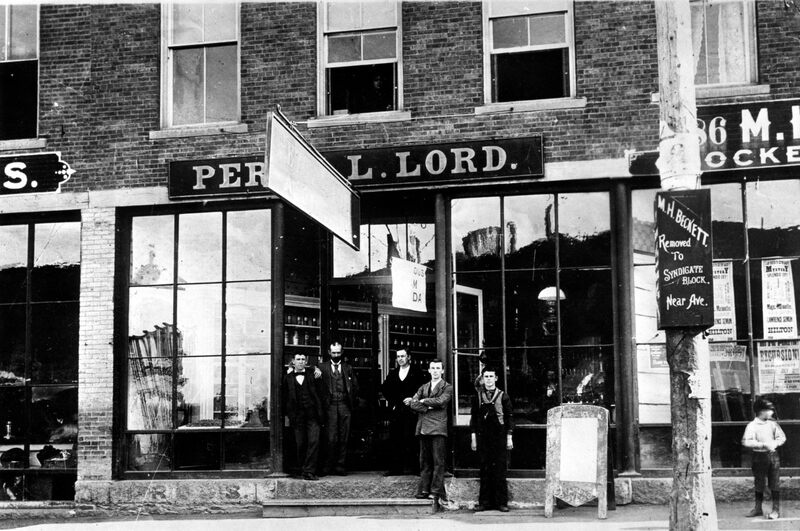 There was a drug store in the building for almost 150 years. 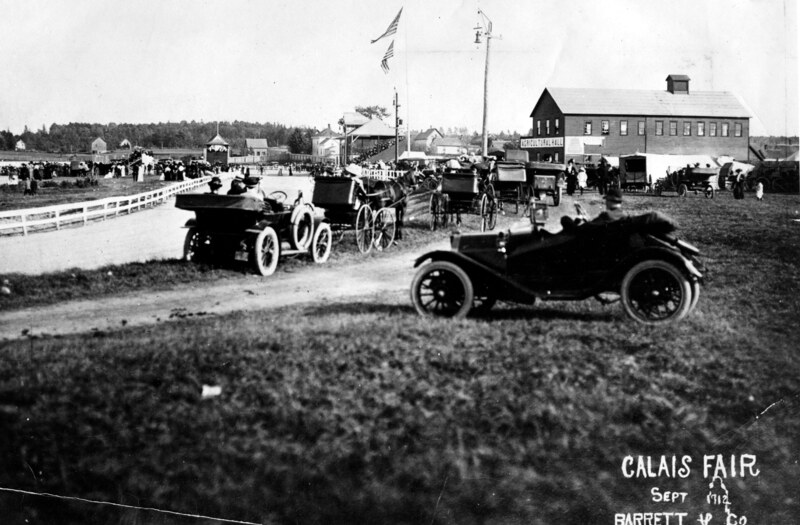 The Calais Fairgrounds had only recently opened in 1912. 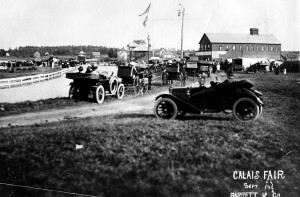 This photo shows the trotting park at the 1912 Calais fair. In the background is Lafayette Street- the small white house just behind the horses is still there as are several to the left. 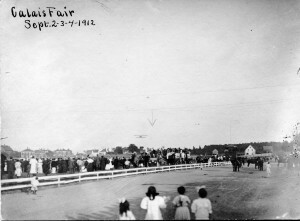 The interesting image in this photo is the airplane coming in for a landing. This may have been the first airplane to land in Calais although we can’t say this for certain. 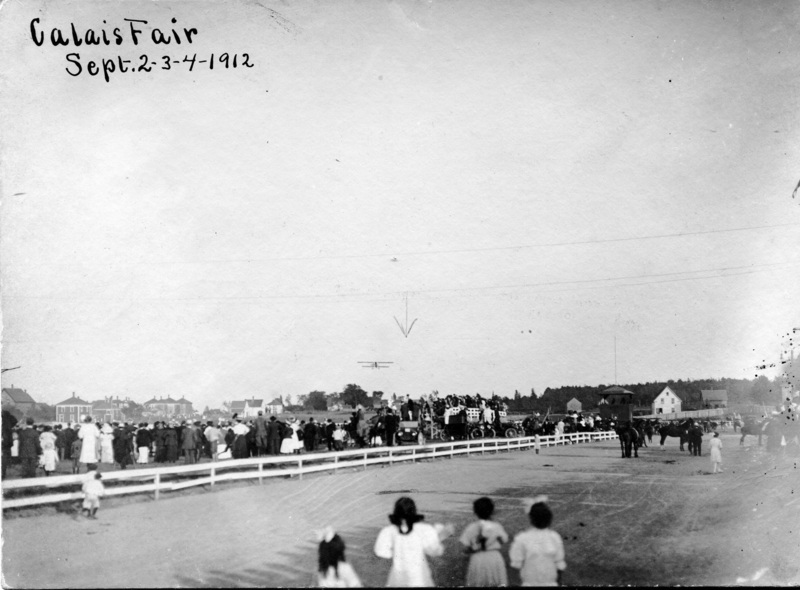 We’ll close with another nice photo from the Calais Fair of 1912.